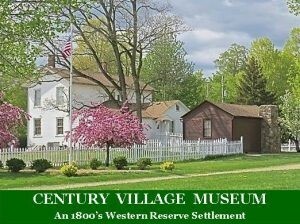 ﻿ Geauga County Historical Society - Century Village - Ohio. Find It Here. The Geauga County Historical Society ensures that the history of Geauga County is preserved for the education and appreciation of present and future generations. Our fully restored Century Village Museum, located in Burton, Ohio is an authentic representation of a Western Reserve Village from 1798 to the end of the 19th century. The Museum contains over twenty historically authentic buildings, more than 15,000 museum artifacts, and a working farm with a sugar bush for making maple syrup. Century Village Museum provides guided tours, offers educational programs, and hosts numerous festivals and special events each year including the following: Antique Power and Steam Show, Apple Butter Festival and Raccoon County Music Festival.